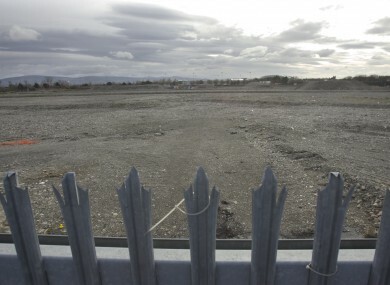 The Dublin Port Company sold the former Irish Glass Bottle site for €412 in 2006, to a syndicate including the Dublin Docklands Development Authority. THE FORMER IRISH Glass Bottle Company site in Ringsend, Dublin is among the new additions to the National Asset Management Agency’s list of properties which are now subject to enforcement action. Placing a property subject to enforcement order means that NAMA is preparing either to sell the asset or to rent it out, in whatever way would raise the most return for the agency and for the taxpayer. A spokesman for NAMA said receivers appointed to the companies controlling each property would make a commercial decision on what the most lucrative option would be for each property concerned. NAMA had appointed receivers to Becbay Ltd, the company which holds the title on the 25-acre undeveloped site, last month. Blogger NAMAwinelake summarised last month that Becbay had spent €100 million decontaminating the site and making it ready for development, but that it now valued the site at only €30 million – some 7.2 per cent of what was paid for it in the 2006 deal. The site is not listed as being currently for sale, however, indicating that the site may be considered as a possible location for the new National Children’s Hospital, as several newspapers reported last month. The iconic Docklands site was sold by Dublin Port Company to a consortium including Bernard McNamara and Derek Quinlan, as well as the State-owned Dublin Docks Development Authority, for €412 million in 2006. The size of the deal – in a deal considered by many to be the epitome of the property boom, with a price of just under €16.5 million per acre for the site. A NAMA statement accompanying the list of properties subject to enforcement action said the total value of the NAMA properties which are up for sale is now over €1 billion. The Irish Glass Bottle site is one of 44 properties added to the list in March. Email “Irish Glass Bottle site now subject to possible NAMA sale”. Feedback on “Irish Glass Bottle site now subject to possible NAMA sale”.